A big part of why everyone seems to love the holdiay season so much is in the annual reenactments of our cherished Christmas traditions. Think about your own traditions, the things you love to do each and every year. I think you’ll find that you agree; as Darth Vader would say, search your feelings – you know it to be true. Some of our favorite traditions are pretty much the same as ‘most everyone else. The Christmas tree decorating, the drive around town looking at all the Christmas lights, the holiday parties, the carols. We may not roast chestnuts on an open fire, but we usually make sugar cookies and let the kids go to town decorating them. My wife loves to watch the same movies every year; I’m more of a once-every-three-years kinda guy for most films, but I’ll watch Die Hard or It’s A Wonderful Life anytime. And even when the rest of the fam sticks in an old DVD that we’ve seem a million times, I’ll still sit down and watch, and even enjoy it – because it’s tradition. PRO TIP: This is a long article with lots of ideas. Pin it to save it for later! 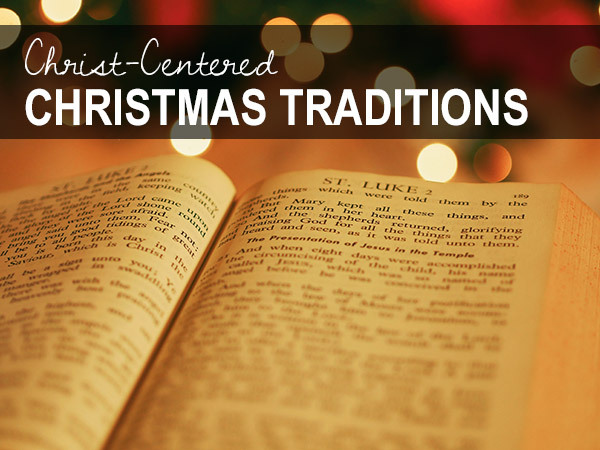 So how can we re-shape our Christmas traditions, and maybe create some new ones, that center around Christ? My family has thought about this a lot, and here are some of the ones we do, plus a few others. These are ones that our kids actually like, because I don’t see the point in making the best time of the year something dreary for the sake of religion. I’d also love to hear your own traditions in the comments at the end! Our church does a lovely Christmas Eve Candlelight Service every year. It’s short, it’s traditional, and everybody gets a candle. Most importantly, it’s a time to get together and rehearse the story of Christmas. We’ve made this a part of our family tradition. It helps that the service is wonderful – we sing classic carols, we read the Advent passages from Scripture, and then our pastor gives a message about God’s plan of salvation. When he gets to the part about sin and darkness, the lights go out. And when we come to Jesus’ entry in the world, a single candle is lit. Then this light is spread about, until everyone’s candle is lit, and we sing again together. It’s beautiful. As we have made fellowship with the local church body a priority and an important, happy part of our holiday traditions, our kids get saturated with these values and hear the story of the Incarnation told in different ways. At church, your children will hear the Christmas story told in song, through the reading of Scripture, in sermon, in children’s church activities, coloring pages and crafts, etc. Oh, and if Christmas falls on a Sunday (as it does this year), go to church. Don’t be these people. Every year on December 1st we pull out our Christmas stuff. 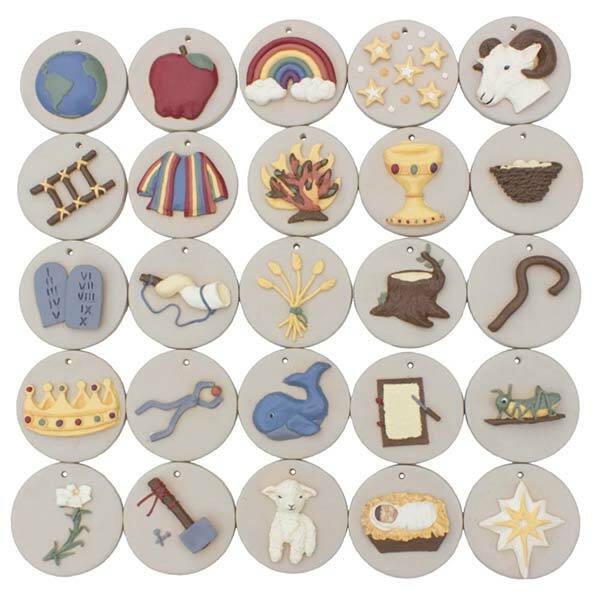 Even if we didn’t get a tree yet, we still start going through our “Jesse Tree” ornament set. Our kids get super-pumped, and each take turns hanging one ornament each evening after we read about its meaning. This is an Old Testament prophecy about how the coming Savior will be a descendant of the great King David (who was Jesse’s son, which is what is mean by ‘from the stump of Jesse’). The Jesse Tree uses this and similar Old Testament prophecies and allusions to tell the story of redemption, from creation up until the advent of Christ. Each year, when we put away all our Christmas decorations, we wrap up all our Christmas books in leftover wrapping paper and stash them away with rest of the holiday stuff until next year. We have silly Santa, reindeer, snow, and 12 Days of Christmas -themed books, along with ones that tell the Christmas story of the nativity and incarnation. Kids are pretty sharp, and we’ve found that ours don’t really like the ones that are overly simplistic, preachy, or cheesy. Everyone’s favorite is The Three Trees, which is a brilliant parable that touches on both Christmas and Easter. You are what you sing. Kids will pick up songs with incredible speed, and the words will be tumbling about in their brains and on their lips for days at a time. Kids love to sing, so make it a point to infuse the content of their singing with the great themes of the classic Christmas carols and Advent hymns. Even if they don’t understand what it means at age 4 or 7 that “he comes to make his blessings flow far as the curse is found,” they will understand it one day. That line in particular struck me as a young adult when I finally tuned in and thought about the meaning of words I had heard every year since forever. It resonated so deeply because it is such a simple truth: everywhere we are, we see the effects of sin. Jesus came to make his blessings flow everywhere, even the deepest and darkest parts of your life and the wide world. That is surely great news! Oh, and make sure the songs you sing around the house are ones you actually like. Anyone – and kids especially so – can tell the difference between singing as a joy and singing as a duty. Make it a happy thing. Don’t be afraid to sing about wanting your two front teeth, making lists and checking it twice, and O Christmas Tree (try adding the last verse). Sing all the songs, bringing “tidings of comfort and joy” alongside the Jingle Bells and Winter Wonderlands and Silent Nights. We sponsor a child through Compassion International, an organization that is explicitly Christian, partners with local churches in the child’s area, and also invests at least 80% of their revenue directly into child development programs. In 2016 that number was 82.4%, with just 7.9% of total revenue going towards administrative costs. These are just a couple reasons why we think Compassion is a great organization. Around the holidays, help your kids get into the Christmas spirit by creating Christmas cards, letters, and drawings together to send to your sponsored child in time for Christmas. You can also easily donate a little extra to send the child a Christmas gift (they wisely don’t let people send gifts directly). Our church – along with many others around the world – makes a big deal about these shoe boxes every year. We always try to beat the previous years’ total of shoeboxes filled by the church, and often as a church we do. If you’re not familiar, Operation Christmas Child is the Christmas-gift-giving arm of the international relief organization Samaritan’s Purse. The idea is that you take a shoebox and fill it with toys, add $7 to cover the shipping costs of transporting it to some remote location, and a child living in an area of poverty will receive a beautiful gift and Christmas cheer. You can get your whole church involved, or you can do it on your own. Check out their website for details. Operation Christmas Child does a great job of working hand in hand with local churches and missionaries. As often as possible it is local Christians who are passing out the gifts, which means that this isn’t just a one-off gift – it’s an introduction to the local Christian community and the story of Christmas and a huge blessing for a child all in one. We make it a point to have each of our two kids help pick out toys to fill the box, and even offer them the opportunity to use their own money to get an extra-special gift that is specifically from them. Plus they make their own drawings and Christmas cards to put into the box. It’s a great way to teach our kids about giving as a microcosm of all that Jesus has done for us. This one is obvious, but it’s easy to forget or overlook in the excitement of a Christmas morning with kids. Read the old, old story of the birth of Jesus. The birth of Jesus is told several times in different ways throughout the Gospels. An ideal passage, especially while your kids are young and fidgety, is Luke 2:1-20. Long enough to tell the whole story, but short enough that you can read through it and pray a thanksgiving prayer in a few brief minutes. Of course you can read as much or as little as you want – Luke 2:10-12 is a perfect 3-verse summary, or you can go nuts with a full-on Festival of Nine Lessons and Carols, or anything in between. The important points are 1) Read the Scriptures, and 2) Tell the true story of Christmas. Eating delicious food is a tradition anyone can appreciate. Have a feast, and tie it in to the classic feasts of the people of God. Christmas began as a “feast day”, and believers have been feasting in commemoration of God’s works since Old Testament times. Thank God for his provision of the feast, the holiday, the gifts, and of course his only begotten Son. Ask everyone to share a favorite part of the Christmas story, or go around the table and tell the story piece by piece. Giving each person an ornament or a nativity scene character might help with this. Make it simple and brief, and let the feast be a time of merriment and celebration so that memories of joy and gladness surround your little ones’ memories of Christmas. You can make this feast extra-special with some unique accents. Try a Christmas Day tablecloth, engrave champagne glasses or coffee mugs with quotes from carols or Scripture, get special Advent placemats, use a nativity scene as a table centerpiece, light Advent candles, etc. These next couple of ideas are ones we haven’t tried yet, but may at some point. In our family’s experience, sometimes less is more, so you may not want to try all of the ideas from above or below at once. Space it out; find one or two that work for you, which your kids love and which you can make happen with joy every year, and then expand from there. Try making the feast a birthday party. Set up holiday streamers and balloons, have a Christmas birthday cake, and sing happy birthday to Jesus. Younger children will love this. Set up your nativity manger, but have Mary and Joseph, the wise men, and the shepherds all set apart. Each day leading up to Christmas, move the figures closer to the manger. This represents their individual journeys to the birthplace of Christ. And of course wait to place baby Jesus in the manger until Christmas day, when all the characters arrive along with the angels. Kids love the daily repitition of moving each character closer to the manger scene, building up the anticipation for Christ’s birth and the celebration of Christmas Day. More ideas for moving nativity scenes here. If you don’t already have one, lots of nativity scenes are available here and here. Boxing Day is celebrated on the day after Christmas, December 26th. This is the traditional day on which the church’s alms box – the collection box for the poor – would be opened and the donations distributed to the poor in the local community. You and your children can set aside time to volunteer as a family, make gifts or care packages, bring good-quality donations to charitable organizations and ministries, or collect a family fund over the holidays to give to a family in need. This helps provide a much-needed connection between receiving gifts (i.e., receiving the grace of God through Christ) and giving gifts (living a life that reflects Jesus towards others). Truly, I say to you, as you did it to the least of these, you did it to me. Give a gift to a widow, orphan, or family in need. You can do this by celebrating Boxing Day (point #11, above), doorbell-ditching a gift drop at a home in your area, or by giving online. What are some of your favorite holiday traditions that celebrate Jesus? Comment below, we would love to hear new – and old – ideas!